Leaving Kruševo behind, we went to the nearby village of Žurče to see a Monastery. 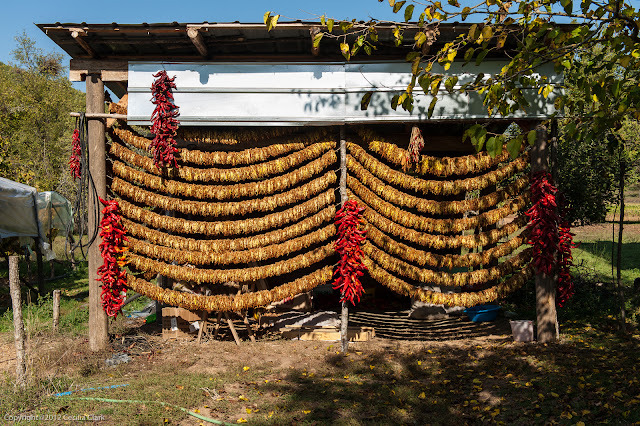 I thought this was the village of Zrze the former home of the unusual icon called the Virgin of Pelagonia, but Zrze is not the same as Žurče. 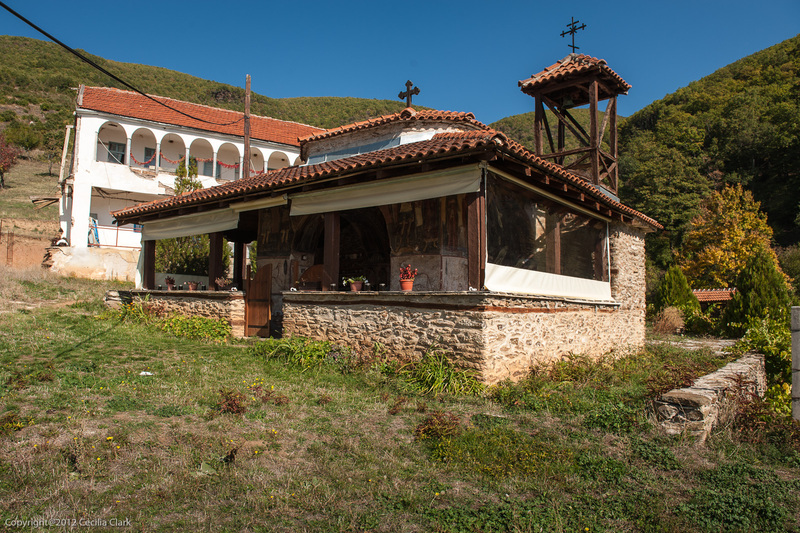 In Žurče we visited the monastery dedicated to Sveti Atanas Aleksandriski. A young sister-in-training named Christina was our greeter. She opened the door to the church and explained both the interior and exterior frescos. Then, she gave us a tour of the grounds. This monastery has been around since at least the 12th century, but the current construction of the church and the frescos date to the early 17th century. The frescos are lovely and unusual. The frescos on the open porch area include naturalistic paintings of life during the months of the year. They illustrate hunting, harvest, sunbathing (while being cooled by a peasant), etc. Unfortunately photographs are only allowed if taken from a distance. The sisters and sisters-in-training of this monastery raise chickens, goats, sheep, and they also had some black deer (one buck, two does, and a fawn) in pens. The buck was very friendly, but the females and fawn were skittish. In an attempt to be self sufficient, the sisters make and sell their own cheese and a rich, dark honey. They have fruit-tree orchards and a greenhouse for vegetables. Christina invited us to have lunch with her. The table was set with pears, their cheese from goat's milk, a spinach-buttery bread. 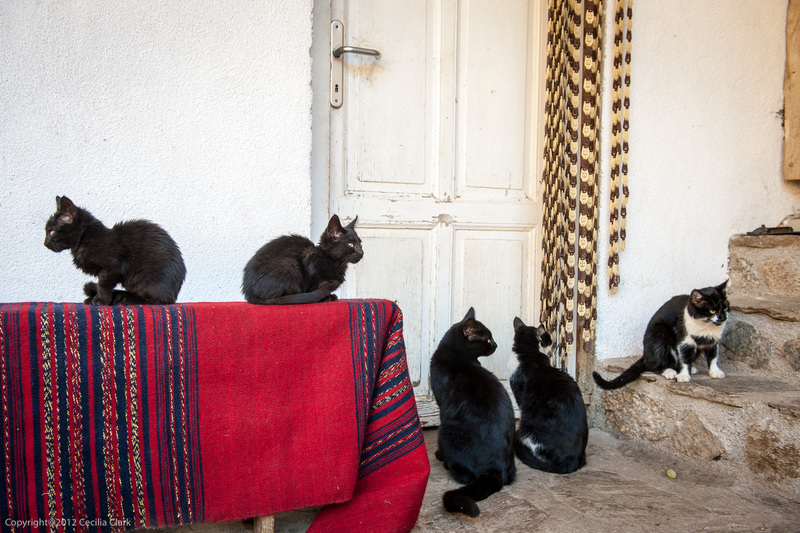 While we were eating, we were surrounded by hungry cats who Christina said must work for a living. She said they only feed the kittens, but they sure acted like cats who were used to being fed by humans. Christina showed us on a map where Zrze is located (north-west of Prilep), but that will be another trip. The village of Žurče is as neat as a pin with many stone structures. 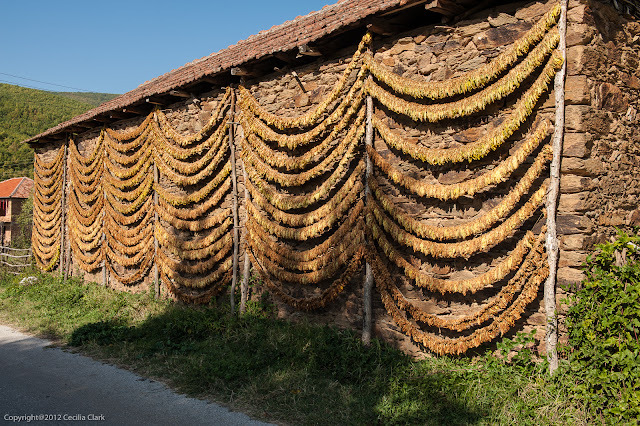 Tobacco was drying everywhere as were peppers. We chatted with a Macedonian who had worked for many years in Australia. 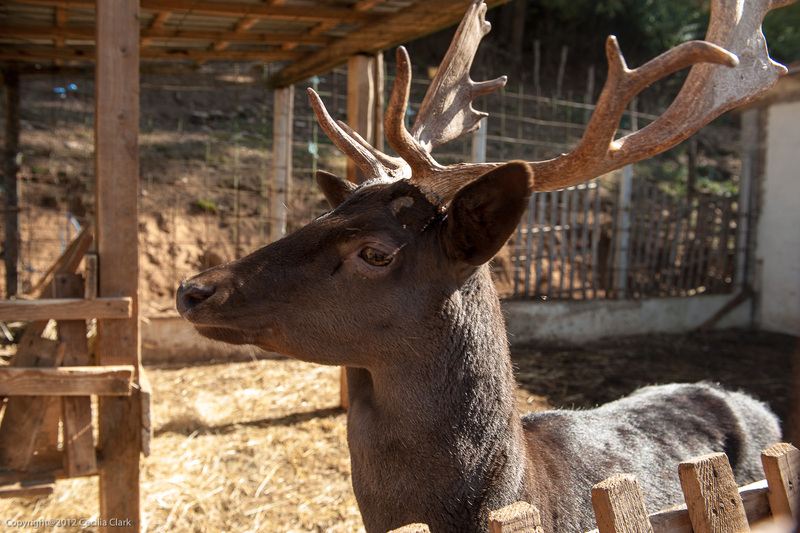 Now retired, he had returned to live and enjoy his life in Žurče. On the way back to Skopje, we stopped once again at the tobacco drying structures in Prilep. 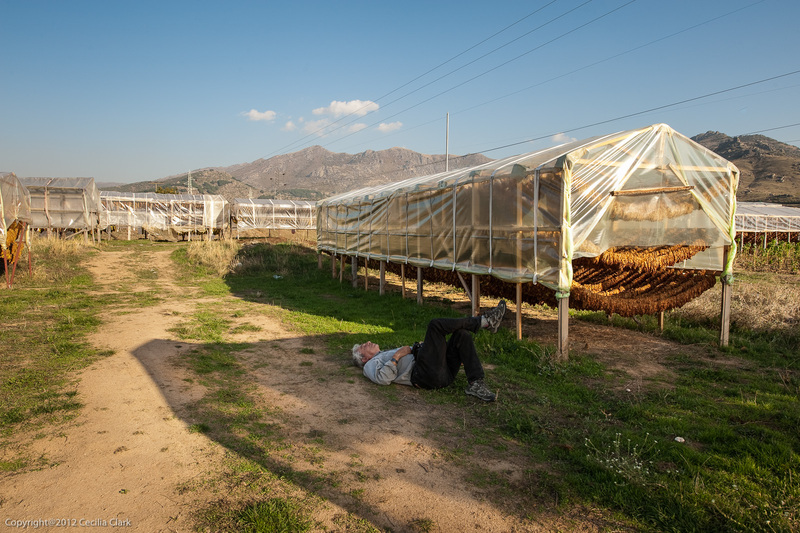 While I was taking photographs, Dan napped and I chatted with a tobacco grower named Branko. 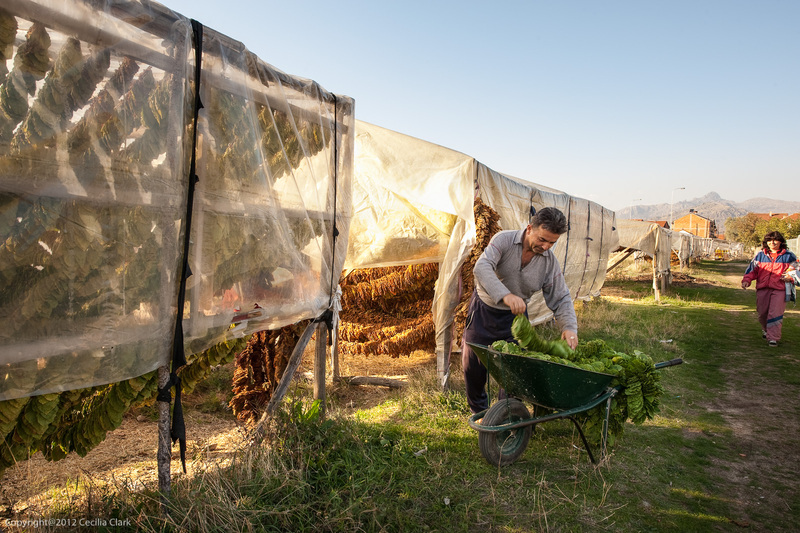 Branko said he will get between 2 to 4 Euros per kilo for his tobacco. The price is based upon the quality of the leaves. He told me that depending upon the amount of sun, the green leaves take between 7 to 10 days to become golden and dry. So, now I know even more about growing and selling tobacco. The end.